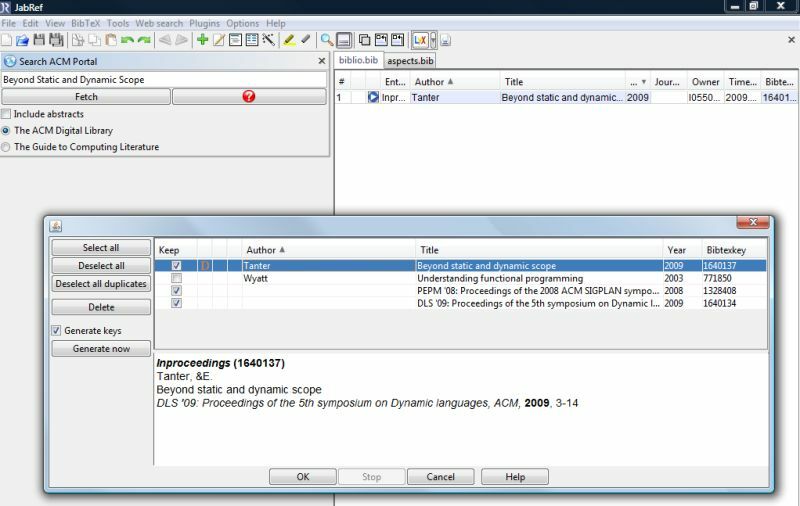 Jabref, a powerful tool to manage bibliography, has a special feature that let the user search bibtex entries online, and import them within your bibliography. A problem occurs when you run JabRef behind a proxy (corporate or not), because no options is available to configure it. Hopefully, JabRef is provided as a jar so we have the ability to modify proxy properties used by java. java -Dhttp.proxyHost="proxy" -Dhttp.proxyPort="8080" -jar "/where/is/the/jar/JabRef-2.6b2.jar"
That’s it, you can search for whatever you want on ACM portal, IEEE, etc. in few clicks. Sorry for screenshot with vista skin, but as my corporate’s laptop is using it, I need to work with it 😀 But this tip is cross platform.